Glomerular Disease: This is damage to the kidney filters and can be caused by infections such as Lyme disease or cancer. Pyelonephritis: This is an infection of kidney tissues. If a veterinarian finds this infection, the bacteria that is causing the inflammation of kidney tissues can often be killed. Neophrolithiasis: These are kidney stones. Unlike in humans, kidney stones actually do not typically cause dogs too much pain in the early stages. Ureteral Obstruction with Hydronephrosis: This is a kidney blockage. If a dog has kidney stones and they fragment, they can cause a kidney blockage that will not allow urine to pass and the kidneys will swell and become damaged. Tubulointerstitial Disease: This is damage to kidney tabules, often with an unknown cause. 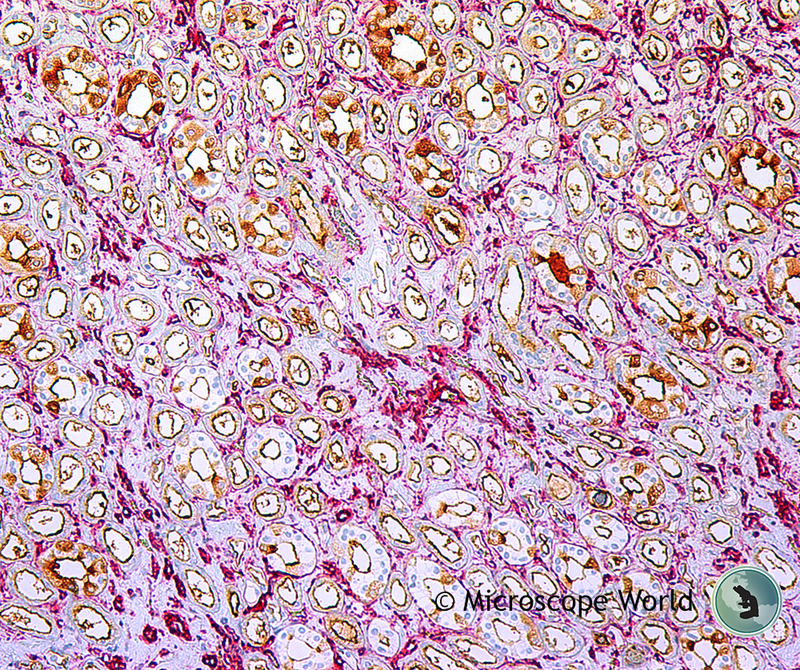 This type of kidney disease can only be determined by using a microscope to examine a kidney biopsy (see image below). Leptospirosis: This is a bacterial infection and can cause kidney disease along with organ problems in both people and dogs. Infection can be caused by contact with urine or other bodily fluids from the infected dog. Toxins: These are medications, household chemicals, and even ordinary food like grapes or raisins. If your pet ingests toxins contact ASPCA Poison Control immediately. Cancer: The good news is that kidney cancer is not common in dogs. The bad news is that treatment options for kidney cancer in dogs is quite limited. If only one kidney is affected it can be removed with a positive outcome. If the cancer is benign or has not spread the outcome can be good as well. Amyloidosis: This is a protein issue with the kidneys where protein deposits replace normal tissue. Hereditary: Some purebred dogs have a higher rate of kidney disease than others. Additionally, some young dogs will fail to develop normal kidneys. 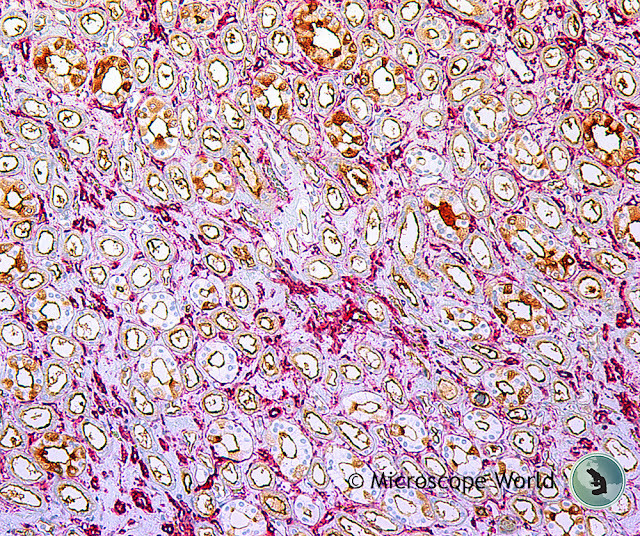 The image below is of a dog kidney and was captured using a veterinary lab microscope with a microscope camera. For more information about veterinarian microscopes contact Microscope World.